I don’t have any new cards today… but the anticipation of many more to come. 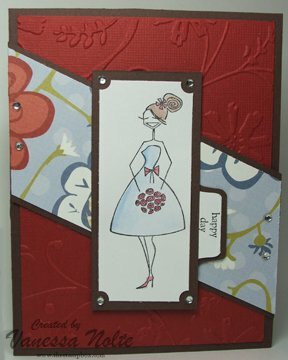 This weekend, I’m going to a Card Making Get-together in the Frankenmuth, MI area! There will be about 50 of us ladies out there. So, if I’m not chatting too much… there will be lots of cards for me to post when I get back. I’m so excited about this. That is all for today! Have a wonderful day! This card was for a Monthy swap that I’m participating in on the SCS Swaps Forum. Each month I receive a packet from someone in my group with some type of designer paper and an image. I have to come up with a design and make 5 of the cards to send to the other people on my team. I absolutely loved this paper (I don’t know if you can tell, but it is kind of shimmery! The image was so fun to water color. I actually have real water colors, I’ve tried the pencils and I have some, but it is hard to get the color I want. With real water colors I can mix some colors to get the perfect shade. 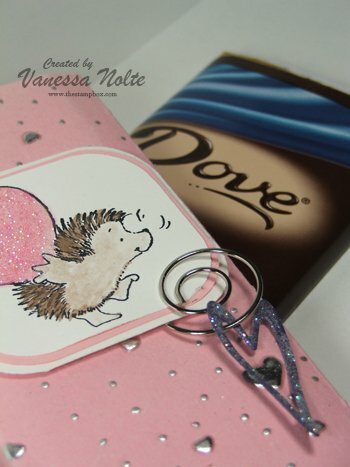 I also used Crystal Effects for the heart on the envelope. Very fun! I know I mentioned that I would be posting a journal that I’m doing soon… and I still plan to, but I want to make sure it is complete before I take picks of it and create a pattern for you. I’m going to a stamping get-together in Frankenmuth area (Michigan) in a couple weeks and have to have all these things ready by then. I’m so excited for this event, I found this on the SCS site… a Michigan Stamping Get Together! There are about 50 of us meeting up there for stamping challenges, projects and just plain fun. I’m really looking forward to it. Well, that is all for now. I have more cards and projects to share, but no pictures yet… so I will probably post them tomorrow. Have a good weekend everybody! 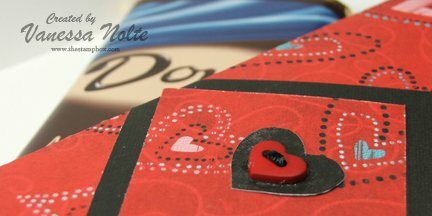 Here is another quick valentines day card this morning. This is actually a card that I made a couple weeks ago. I kind of got away from the pink and red on this one and went with something a little different. 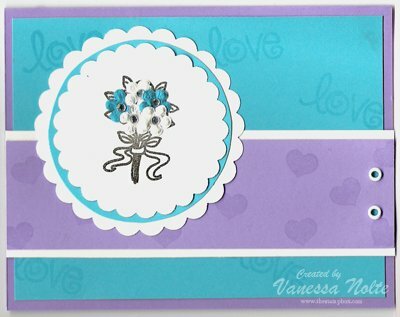 The flower bouquet stamp is a $1.00 stamp from Michaels… I really use those a lot! I used Primas and bling to dress up the bouquet. 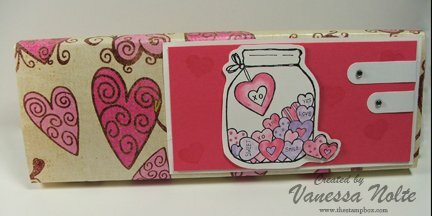 I used the versa mark to stamp the heart and “love” on the background. Have a great day everyone! 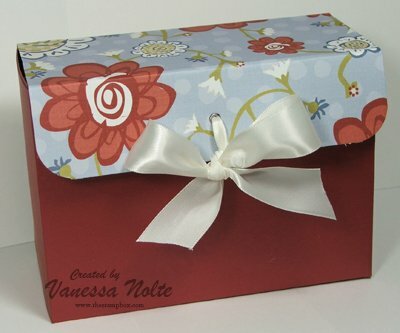 I love making these card boxes! 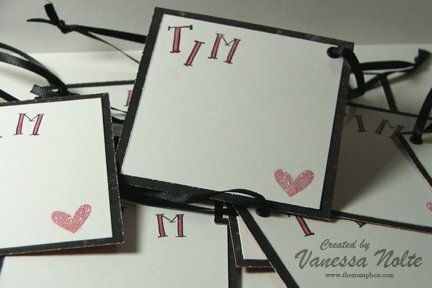 I use them for gifts all the time, they are so fun and easy to make and they come in handy for those that don’t really make cards. 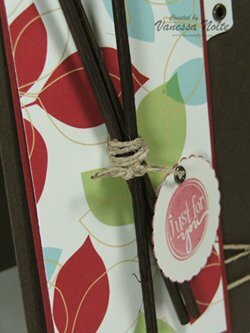 I make a box and fill it with cards and envelopes and wrap it up… this one that is pictured, I didn’t do any stamping for… just cutting, scoring and gluing. I got this pattern off of SCS… I will find it an include a link to the pattern very soon, but I can’t find it right now. I didn’t do any stamping this weekend like I wanted to… it has been a crazy weekend…. 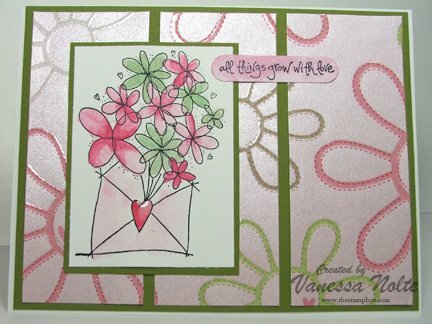 I will do some more stamping this week and share more with you. Have a great evening!! I watercolored the image. After the image dried, I colored the heart with a glue pen and sprinkled ultra fine glitter on. The die cut heart was done the same way. I used a glue pen to color the heart and then sprinkled with glitter. The pink paper underneath (the silver embossed paper) was purchased like that from a local scrap-booking store. A great find! → 3 CommentsTags: Anything but a card... · Misc. 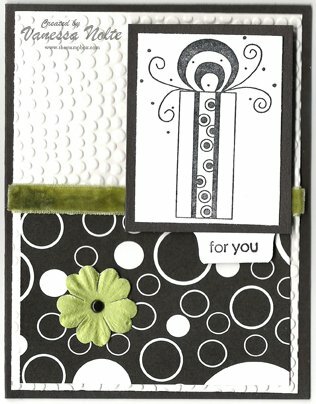 Here is a card that I did a little over a week ago for theÂ SCS January Wish RAK card Challenge. Â It was a sketch challenge. Â I’m really liking the sketch challenges… it forces me to get out of my box and do something I haven’t done before. 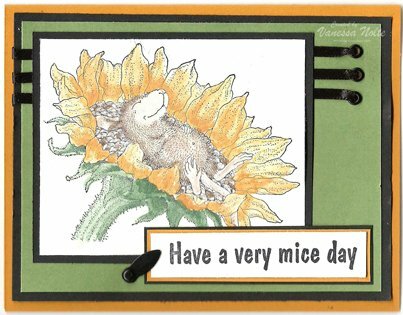 Â For this one, I got the House Mouse Image and saying from a Wish RAK secret exchange and the black eyelets from the Wish RAK wish list. Â It took me forever to watercolor the image, I wanted to make sure it was just right. Â I actually use really watercolor paints from a local art store on all my watercolor images. Â I feel like I can have more freedom in mixing colors with those and I have a million colors. Â I think this is one of my favorite things to do! 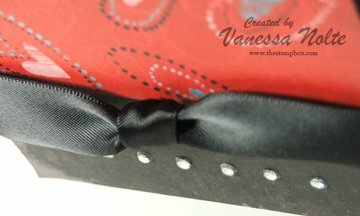 Â Then I just added the three strands of ribbon with the eyelets and the little photo holder with a brad and finished. Â So, are you all watching the Superbowl tonight? Â I’m not really a football fan and neither is my husband, so I’m really out of the loop with this. Â I will probably be doing some stamping tonight. Â Have a great night! So I spent the afternoon getting some cards done for someÂ CPS. Â I had fun doing these and using some different things for one of the cards. Â It is getting really late right now and I have to get up early, so this may not be as detailed as I would have liked it to be. Â Anyways, here is my first card. Â So, I used one of my reed diffusers that I got for a gift a few years back and took out a couple of the reeds. Â I cut them in half for this card. Â The Sketch called for some type of plant/stick with leaves. Â I wanted to do something different. Â See the sketchÂ HERE. 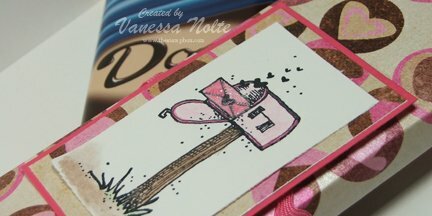 Â I used a $1.00 stamp from Michaels on both of my cards today. Â I got both of them as little gifts from Wish RAK exchanges. Â For those of you that don’t know what I’m talking about with a Reed Difuser, it is basically a bunch of reeds in a jar of oil… the oil soaks up through the reeds and makes your room smell lovely! 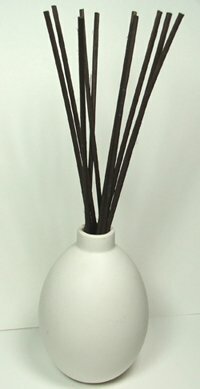 Â Here is my reed diffuser that I took them from. Â Hopefully it doesn’t look too bare… it is a decoration in my house! Â My next card was for the CPS sketch #40. 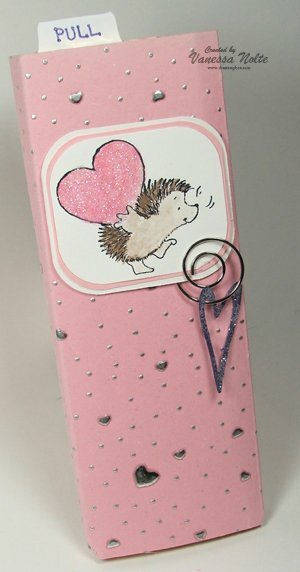 Â I thought this could be a good Valentines day card.Â I used another Michaels $1.00 stamp and my cuttlebug again. Â I really love that thing! 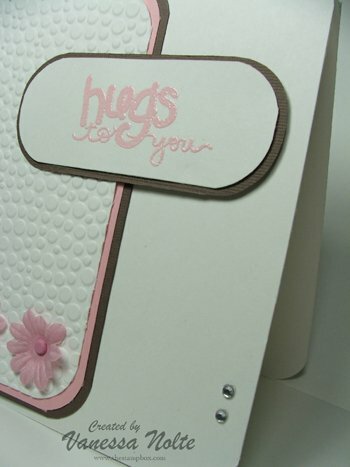 Â I embossed the “Hugs to You” with Petal Pink embossing powder. Â HEREÂ is the link to this Sketch. Â Very fun! Â Well, that is all I’m going to share tonight… I’m so tired! Â Have a great night everyone! I spent some time in the last couple weeks to make some cards for theÂ Wish RAK January Card ChallengeÂ at SCS. Â I love doing black and white cards. Â That is where the inspiration also for the header on my blog. 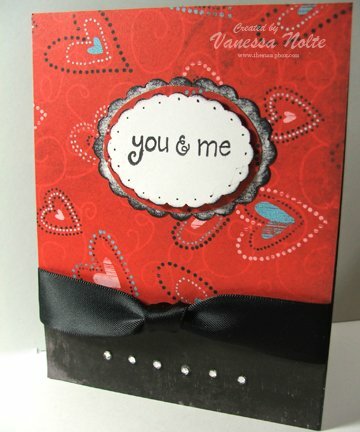 Â The challenge was to create a black and white card with a punch of color with an embellishment only. Â I made a couple cards for this challenge. Â My challenge is finding the time to really spend on the design of the card… once the card is designed it is easy to put some together. Â Anyways, here are the cards that I came up with. Â What do you think? 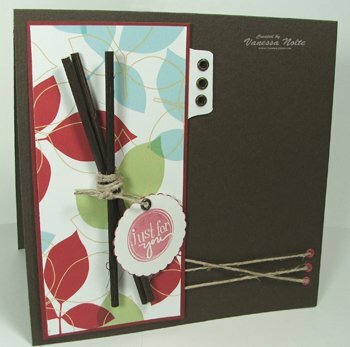 Â I went with the same concept for this card, just different colors and paper. Â I love the fiber string stuff, but haven’t used it yet. Â I was excited to get this from Melissa at SCS for a Hostess Appreciation Swap. 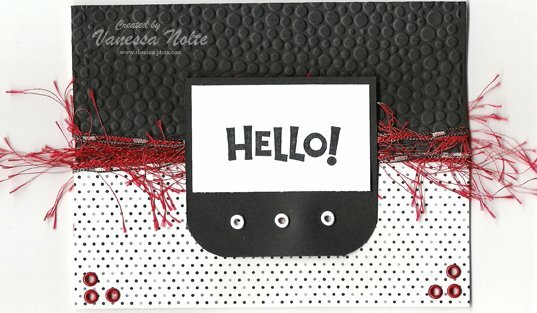 Â The “Hello” stamp is a part of a set fromÂ Stampin Up. Â This is another set with lots of circles… I really like my circles.